The time has come to cast estate planning in a fresh light. For too long, parents and their advisors have conducted estate planning behind closed doors. Each year, billions of dollars of family assets pass from benefactors to inheritors but the process continues to be one of the most sensitive—and secretive—activities within families. Every year, countless siblings find themselves in disputes over how assets are passed between the generations. Much of this costly family misery could be avoided if parents would talk openly with their adult children about what they are thinking of doing with their estates, what they hope to achieve, and how their decisions will affect the entire family. Grown children are often in an excellent position to give parents input and feedback on plans that will ultimately have more impact on the children’s lives than on the parents’ lives. While parents are ultimately responsible for their estate and philanthropy plans, talking openly with grown children makes enormous sense because these plans are about the children as much as they are about the parents—if not more. Estate plans can help streamline a family’s transition from one generation to the next. While estate plans address what parents cannot take with them at their deaths, they are about much more than just money and possessions. They are about the parents’ and the family’s legacy. This Passages issue paper is intended to help families initiate and carry out an effective discussion around estate planning. The paper introduces a new, holistic approach to estate planning, and describes how the different stages of life that children and parents go through affect the context in which estate planning takes place. The paper concludes with a detailed look at options for family estate discussions and retreats. “Holistic estate planning” is a new way of thinking about family transitions and how things of value are left to family members and others. It seems inevitable that changes will occur in the way people plan their estates and their philanthropy, given the widespread changes we’ve seen in society and in families. More and more baby-boomers are becoming involved in the estate-planning process, either as grown children or, more recently, as parents. Many of them are highly educated and generally well acquainted with social and psychological dynamics. Many are less paternalistic than their parents, and have raised their children to speak openly and to challenge authority. At the same time, there is also greater affluence, and a broadening array of life pursuits. All of these factors make people today more positively disposed toward a holistic approach to estate planning in the same way that others have embraced a more holistic approach to medicine. It wasn’t long ago that society viewed doctors as gods with powerful chemical, radiological, and surgical tools. All patients needed to do was allow doctors to diagnose and treat them. The medical profession believed that the cause of every problem and disease could be discovered and cured by a physical or chemical frontal attack. Over time, however, a narrow focus on symptoms and high- tech cures caused many patients to believe that physicians had lost sight of their humanity and wholeness. Patients became more actively involved in their medical treatment and wanted to discuss their options and alternatives. They began choosing more holistic therapies that viewed people as whole beings with bodies, minds, and spirits. The analogous shift in estate planning, which has already begun, is to view estate planning as a process that involves the whole family, and to realize that involving grown children in this process can make it more meaningful, more satisfying, and more successful. When viewed in the context of the whole family, it is easy to appreciate the major life transition older parents are entering as they begin estate planning. It’s a transition that profoundly affects everyone in the family. The estate-planning process is the closest thing our society has to a rite of passage to the final stage of life. Just as people beginning to deal with their own mortality require assistance transferring their tangible assets upon their deaths, they also need help defining the terms of the rest of their lives and encouragement to take steps to enhance their personal relationships with their loved ones. With the right approach, parents can improve the likelihood that their children and grandchildren will have better, not worse, relationships as a result of their estate plans. Unfortunate and sometimes tragic mistakes can be avoided. Family members can be included, rather than shut out. People no longer have to guess about what will happen and how it will affect others. Family members can talk openly and gain confidence in their future as a family. They can share their perspectives, explore options, and gain an appreciation of one another’s needs and concerns. They can have meaningful discussions about each other’s values and the values they share as a family. They can consider if, and how, they could use the family’s assets to help other people. Holistic estate planning, like holistic medicine, looks beyond the narrow view and sees the full picture. What was previously considered taking the broad view, i.e., coordinating among the parents’ team of tax, legal, and estate-planning specialists, is really a narrow view. True holistic planning expands the constellation of people involved and suggests that initial planning includes a discussion among both the benefactors and their adult beneficiaries with the help of professionals. As Jay Hughes explains, “Families need coaches to help them find their own answers.”1 Once the parents have clarity about their intentions and a greater understanding of how their plans might affect their children, they are in a much better position to move forward confidently and complete a plan with their team of advisors. Holistic estate planning also expands the definition of wealth to include intangible personal and family assets as well as more tangible ones. It broadens the goals of the process, thereby improving the likelihood of maintaining family harmony both during the process and after the death of the parents. While broadening the estate-planning process, a collaborative, holistic approach sacrifices none of the advantages of a traditional approach. After parents have discussed their assumptions and intentions with their adult children, they will still rely on their professional advisors to maximize the ultimate benefits for everyone involved. Because estate planning is about the family, the way the planning is carried out needs to change as the family changes. It changes as the fortunes of the parents change. It changes as the thinking of the parents changes over time. And most obviously, it changes with the growth and maturity of the children. Interestingly, most public discussions of estate planning are focused on parents with young children, possibly because planning with them is a fairly straightforward process. The primary goal of young parents is quite simple: to protect vulnerable children. Parents usually agree on this priority, and, since young children have neither the cognitive ability nor the life experience to comprehend estate planning, there is little reason to involve them. On the other hand, many advisors suggest that young children should begin learning about family values and would benefit from exposure to the basic concepts of philanthropy. In fact, these early years may be the ideal time to help young children develop their values and attitudes toward money and wealth. Figuring out the role that money plays in one’s life is a major accomplishment and, as with most things, parents have more influence than anyone else. The first opportunity to help shape children’s values related to money is early in life when they first begin recognizing that money is currency to obtain things. Interestingly, the last opportunity is around the transfer of their assets. Estate planners and parents will sometimes begin gifting money or other assets to children as a way of avoiding future taxes. They may put children on a “payroll” for the same purpose. These tactics can be very confusing to children who are just beginning to learn that one of the reasons to work is so they can earn money. They may conclude that getting money without working trumps having to work for money. Parents who’ve been known to say in exasperation, “Money doesn’t grow on trees,” are understandably hard pressed to explain where the money is coming from. Parents worry with good reason about teenagers being consumed by the culture of blatant materialism. Psychologist Tim Kasser and other researchers have found evidence that people who organize their lives around acquiring things report greater unhappiness in relationships, poorer moods, and more psychological problems.2 Psychologists see clear mental health distinctions between people who value extrinsic goals, which focus on possessions, image, status and receiving external rewards and praise, and those who value intrinsic goals, which emphasize personal growth and connections with community. Adult children in their twenties are in an ambiguous position regarding their parents’ estate planning. They are part of what sociologist Susan Littwin called “the postponed generation.” A growing number of young people entering their twenties over the past two decades have postponed the responsibilities and autonomy of adulthood.3 Parents of these young adults are anxious to see how they will fare: Will they take charge of their lives? Will they be responsible about money? Will they develop a passion for life or will they flounder? Most adult children in their 20s and 30s are building their identity and beginning to establish themselves in the adult world. Parents of children at this stage express fear that large sums of money, or even the promise of future inheritances, will make difficult choices for children even more difficult. In her book, Navigating the Dark Side of Wealth, Thayer Cheatham Willis describes how enormously challenging inheriting money can be for young adults. Just knowing that they will inherit money produces dramatic changes in their thinking and relationships, and is often a burden. Willis calls it the “spirit-sapping dark side of wealth.”4 Instead of being a resource that helps develop greater competence, money can result in aimlessness, apathy, and purposelessness. David Meyers has described how visions of more money than they could make on their own can de-motivate some young adults and nudge them down a path of materialism and consumerism.5 This is a real fear of many parents of wealth. To illustrate the problem, the parents of a daughter contemplating a challenging graduate school program worry that she will decide that it’s not worth the personal cost once she knows she’ll inherit money from them in five years. Parents may wish to bring young adults into at least part of the estate-planning process with the goals of educating them about the responsibilities and opportunities of wealth and preparing them for their inheritance. Estate-planning attorney Douglas Freeman warns that the last thing parents want is for children to have large sums of money dropped in their laps with little or no planning.6 There are professionals who specifically assist families in educating children to be prepared to deal with an inheritance. Some years ago, a woman who had no children convinced her brother and sister to come to a meeting with her team of advisors. She wanted help getting her siblings to recognize the wisdom of preparing their children—her nieces and nephews who were in their early 20s—to receive the windfall inheritance they would soon receive from a generation-skipping trust established by their deceased grandparents. When the grandfather sold his business, he and his estate-planning attorney drafted his will and set up trusts to transfer his financial assets to his three children and four grandchildren. When his three children received their inheritances right after he died, two of them went through tumultuous times. The woman’s brother became an alcoholic and had an affair with his secretary, which destroyed his marriage of twenty years. The woman’s sister quit her job, made numerous bad investments and became severely depressed for years. The woman desperately wanted her siblings to recognize that not being adequately informed and prepared for their inheritance was a key element in their personal struggles and wanted it to turn out better for their children. She was able to convince her siblings that the next generation should be informed about what was going to occur, that her nieces and nephews would be offered financial education opportunities, and that she, along with her brother and sister, would create a philanthropic vehicle that the children would help run. Once children have matured and are no longer dependent on their parents for material support, the advantages of bringing them fully into their parents’ estate-planning process become clear. For parents of children who are in their thirties, forties and beyond, estate planning is no longer about ensuring that their children are adequately fed, clothed, housed, and educated. Grown children are usually already caring for their own basic needs and sometimes their children’s as well. When children reach this stage of life, bringing them into the estate-planning process is much to their, as well as their parents’, advantage. Parents usually want what’s best for their children and the surest way of learning what is best for them is hearing directly from them. Engaging grown children in a family dialogue provides access to vital family knowledge of which neither parents nor their advisors may be aware. As an example, some grown children who are well off don’t want to inherit more money and would prefer to have their parents pass it directly to their children. Other grown children might not want their parents controlling when and how much money their children receive and would be upset if the grandparents set up generation-skipping trusts for their grandchildren, certainly without consulting them first. Withholding information can create a breeding ground for suspicion, misunderstanding, and even paranoid thinking. Sharing information allows grown children to plan their own careers, personal lives and families more realistically. Sharing information minimizes the time wasted on guessing or ruminating about one’s inheritance or planning for unlikely events. In one family situation, a reasonably wealthy 87-year-old mother had completed her estate planning with her attorney but never told her 62-year-old daughter what would happen when she died. The daughter, who tended to many of the emotional and physical needs of her mother, was a divorced high school teacher with two teenagers who struggled mightily to make ends meet and had very meager retirement savings. In her financial desperation, she vacillated between the fear that her mother had no money left and the fear that her mother had considerable money but was not planning on leaving a cent of it to her or her children. The daughter was a competent and assertive woman, but like so many adult children, she felt she would be viewed as greedy if she asked her mother about her plans. Though the daughter eventually inherited a half-million dollar estate, it was only after she had suffered significant and needless emotional turmoil from being kept in the dark for years prior to her mother’s death. Being kept in the dark about parent’s plans can create a host of complications for grown children. For example, they may have young children and need to do their own estate planning. Without adequate knowledge about their inheritance, they may make flawed estate-planning decisions. Not knowing what they are likely to receive could also cause them to postpone their own planning, leading to dire financial consequences for their spouses and children. The prospect of inheriting money is unlikely to deter older children who are independent of their parents from being productive members of society, as it might have when they were younger. Their values and careers are usually fairly established. In some cases, their parents’ legacy may well have as much emotional significance for them as financial impact. Also, older children are likely to respond positively to being brought into their parents’ planning even when parents fear that they won’t like what they hear. Family transitions can occur with the full participation of parents and grown children together, as in the holistic model, or alternatively with only the participation of either the parents or the children. Transitions with only parental involvement occur when parents engage in discussions only with their advisors and not their children. In these cases, children only learn about decisions when the parents have passed away and the children are in the middle of dealing with the loss. Transitions with only the children’s involvement occur when parents bow out of the whole process and leave everything—possessions, discussions, negotiations, and decisions—for children to sort out after they’ve died. Parents sometimes involve some but not all of the children (e.g., making one or two executors or trustees), which is often a prescription for resentment and schisms among siblings. It can greatly alter the relationships among siblings, often in unpredicted and negative ways. One other variation involves minimal engagement on the children’s part. This occurs when the parents inform, but do not discuss their estate planning with their children. Clearly better than sharing no information whatsoever, this approach is still likely to convey a lack of trust or confidence in the children. Just as children advance through stages of growth and maturity, older parents also face different challenges than they did when they were younger, perhaps when they made their first estate plans. Estate planning during the later stages of life may be more about emotional and personal issues than purely financial issues. In comparison to the enormous amount that has been written about the financial and tax challenges awaiting parents who have assets to pass on to the next generation, little has been written about the personal and family challenges. Since each family has its own set of circumstances, the following list of things to consider is not meant to be exhaustive. However, it provides an overview of some of the challenges and realities that many elderly parents and families face during the estate-planning process. Erik Erikson, a psychologist whose eight-stage model of human development is perhaps the most widely known and accepted, postulated that older adults, in the stage he termed, “Late Adulthood,” are often striving to experience a sense of integrity while warding off feelings of despair.7 This is a period of reflecting upon one’s life and one’s role in the larger scheme of things. It is also a time of coming to terms with the nearness of death. Ultimately, Erikson claimed, if older adults have achieved a sense of purpose and fulfillment and a sense of unity with others, they will accept the transitions they face, even death, with a sense of integrity. Just as healthy children do not fear life, Erikson said, healthy adults do not fear death. The work of Elisabeth Kübler-Ross with older patients also suggests that the issues people face as they approach the end of life are a complex mix of physical, psychological and social factors, all of which need to be addressed for dying to be accepted.8 Transferring assets—both tangible and intangible—can be such a vital source of meaning in this late stage of life that it is beneficial to explore the possibilities more thoroughly than is typically done. Too often, giving “gifts” to family and other individuals backfires and weakens an older person’s sense of integrity and connection. Both givers and receivers lose some of the “value” of the giving process if it is not done well. When it is not done well, it might be compared to giving a birthday present without a card, note, or wrapping paper. The gift is given and received but the sentiment may be missing for both giver and receiver. In the worst case, when transferring assets is not done well, it can be a destructive family experience. Even the fear that it may be destructive can lead to feelings of despair. No one wants this outcome, but few parents know how to transfer assets in such a way as to maximize the emotional and social benefits for all involved. The value of any estate gift can be greatly enhanced when the gift is given in person and discussed. 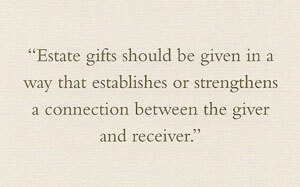 Estate gifts should be given in a way that establishes or strengthens a connection between the giver and receiver. Simply knowing that your daughter will inherit a sum of money from you pales in comparison to the gift-giving process while you are alive. Traditional estate planning doesn’t give parents a foolproof way to communicate their wishes and reasons for their actions to their children. Moreover, since it’s the children who will have to live with the decisions of their parents, they should have a reliable way to understand the rationales of their parents’ decisions. While it is safe to assume that most parents want to treat all of their children fairly, it is not safe for advisors to assume that their notions of fairness will correspond to those in any given family. For example, one couple, who both had children from prior marriages, decided that everything they each owned going into the marriage would be jointly owned. Given the type of egalitarian relationship they wished to have, and their belief in the intangibles the wife was contributing to the relationship and to both families, this made sense to them, despite the fact that the husband had five times the wealth that the wife had. Not many advisors would suggest such an interpretation of what is fair, but advisors have to be extremely cautious when advocating a particular strategy to achieve a sense of equity within a couple or in a family. Advisors should layout the pros and cons of various strategies, but it is up to the couple or family to choose a strategy that makes sense for them. Many parents feel confident that they know what their children will feel is fair. Time and again, their children prove them wrong. Even between husband and wife, it is dangerous to assume that one will know what the other regards as fair. When people who are parents remarry, estate-planning issues become more complex, leading some parents to try and avoid the issues altogether. For parents with blended families, it is doubly important to have the assistance of a family expert to help sort through these issues and develop a sense of direction before plunging into technical matters. As the example of the couple in the previous section demonstrates, financial and power inequities within remarried couples can pose special challenges. It is common for the person in the marriage with the greater financial power to have detailed technical discussions with his or her legal and financial advisors before having thorough discussions with his or her spouse. Such discussions often put the cart before the horse. Ideally, couples work through these issues together before expanding the discussions to include their adult children from their previous marriages. Some parents spend a significant percentage of their assets on a child with special physical, mental, or emotional needs. In some cases, they must plan their estate with special provisions for the long-term care of that child. When the child is older, and if his or her care will fall in some measure into the hands of siblings, they should be brought into the planning so that the family members all know how the child with special needs will be cared for. Almost by definition, intangibles are more difficult to talk about than the tangibles. As Charles Collier points out in his book, Wealth in Families, “the hardest, yet most rewarding, part of the planning process is asking essential questions about what people want to preserve-besides financial wealth—and how they can enhance each family member’s growth.” 11 A growing number of parents are writing ethical wills as a way to ensure that the people they care about most will know the ideas, principles and values that they hold most dearly. An ethical will is a document that bequeaths to loved ones a philosophical and spiritual, rather than material, legacy. Ethical wills can range from one page to bound volumes. People sometimes use audio and videotape to record these messages. When children are young, such a written statement or recorded message may be the only way for them to discover these things about their parents. When children are grown, an ethical will can be augmented by live, back-and-forth discussions between parents and children. Overcoming the reluctance to discuss money presents a high hurdle for many parents, especially if they have never discussed their personal finances or wealth with their children. Money is among the most difficult-to-discuss subjects for most people, largely because it carries great symbolic meaning. What it means to one person may be one hundred and eighty degrees different than what it means to another. This is true even among siblings who have grown up together. It is also true for spouses who have lived together for decades. By not discussing this highly taboo subject, families perpetuate confusion about money and make it more powerful than it actually is. For older parents, talking about their estate is tantamount to acknowledging the fact that they will die, which is not an easy or pleasant subject for anyone. Death is the ultimate and final loss of control. Talking even indirectly about it is enormously challenging, both for parents themselves, and for children talking about their parents’ deaths.Sometimes it is easier for parents than it is for grown children, who may view it as a discussion about their own—as well as their parents’–mortality. Thus, parents and children may unconsciously collude to avoid these subjects. Some parents hide their fears about talking with their children beneath claims that they don’t really care if their children fight over their estate after they are gone. Such bravado may be a defense for feelings of inadequacy about dealing with one’s mortality, the potentially conflicting opinions of children, or the emotional storms these discussions could provoke. Even in these mobile times, children are the most likely people to help parents if they become incapacitated. Children are the ones likely to ease the weight of dealing with the transition, should it become emotionally or financially difficult. Without discussing these issues face-to-face, people can develop serious misunderstandings about how family members feel and what they are thinking. So, during parents’ final years, children still need them, and parents increasingly need their children. One of the major challenges that many parents face is passing ownership of an asset, or portfolio of assets, to more than one adult child. They might leave something to their children jointly for a number of reasons. Parents may have more than one child working in a business, or a family business may be their primary asset and they may not have sufficient other assets to distribute to children who are not working in the business. Parents may have established a family office or foundation and want more than one of their children to work in it or serve on its board. They may have real estate that they have been putting in trust for their children over the years for estate-planning and tax purposes. People often leave assets jointly to their children in an attempt to be fair and treat all their children equally. While there are certainly tax and other advantages to transferring assets to children jointly, countless siblings have discovered how difficult it is to be forced to make financial and management decisions together. Making decisions with siblings can be even more challenging than making decisions with a spouse. Even siblings who have enjoyed close and loving relationships have discovered what a curse it is to wake up and discover that they are no longer “just siblings.” Now they are business partners as well. The desire to have children share an asset together is quite understandable. This is especially true for parents who own a vacation home that has been a focal point for the family. When children have all enjoyed a place on the lake, or a chalet in the mountains, there’s a natural tendency to want them to continue to share it and have their children experience the same joy that they did. The reality of passing such property to children is usually less sanguine than the fantasy, however. Any type of ownership has its share of headaches, and co-ownership has more than its share of heartaches as well. It is critical for parents to bring their adult children fully into a discussion about shared ownership plans of vacation properties in order for them to have a chance of working. Part of the process should involve the adult children working together to establish all of the parameters of their being partners in the property. Siblings who have documented their understandings in a charter, or some other similar agreement, have the evidence they need that they can negotiate important issues and work together. The process of developing such an agreement can serve as both a road test and insurance package for siblings. It also gives parents the peace of mind that their children will be able to work productively together, negotiate their differences, and successfully co-own whatever asset they hold jointly. A partnership charter is a tool that was developed after ten years of mediating disputes among family and non-family partners. It captures the lessons from those partners about how they had gotten into difficulties with one another. It is like a short course in how to work together as partners, touching on both the business aspects (ownership, roles, decision making, money, and governance) and interpersonal aspects (personalities, values, expectations, and fairness) of partnership. It also explores how siblings would handle unexpected circumstances that could arise and what they would agree to do in the event that conflict erupts. When Roger and Mary Neveu were ready to plan their estate, they asked their five children, each of whom were involved in the family business, to spend a weekend in a partnership charter retreat. They wanted to be sure their children were really prepared to work together and co-own their Massachusetts company, Notch Mechanical Contractors. They had two other children who were very clear that they did not have an interest in being part of the business and Roger and Mary were committed to setting aside other assets for their inheritance. The siblings worked out a series of agreements for owning and managing the company together. The agreements included such details as what they would do if one of them failed to perform his or her job adequately. They discussed and agreed upon whether or not to allow ownership to move into the third generation. The co-mediators guided them in using feedback from personality and values tests to explore and come to agreements about the interpersonal side of working closely together. In the end, their signed 25-page charter was given to their parents and their parents’ estate attorney to help in drawing up Roger and Mary’s overall estate plan. Philanthropy can be a wonderful way to initiate an estate-planning discussion with adult children and have children engage with each other in an ongoing way. It can ease family members into more personal and sensitive issues related to estate planning. Exploring the possibilities of philanthropy can enhance an older person’s sense of integrity and meaning and diminish the likelihood of feelings of despair. When adult children participate in the development of philanthropic plans, they have a stake in the bequests. They are less likely to view the entire process as a zero sum game, and more likely to see it as one part of multigenerational giving, thereby enhancing their connection to their parents and to one another. Siblings are also more likely to develop a sense of stewardship toward the bequests and to carry on their parents’ ethos of giving and caring. If not carefully managed, estate discussions can devolve into individuals struggling with one another to see what or how much they can get. Pursuing philanthropy as a family can have a profound, positive effect on conversations. It shifts them from I-centered conversations to we-centered conversations. We-centered conversations can be helpful when families are engaging in sensitive discussions about money and possessions. For some families, joining together around philanthropy can be a strengthening, uniting experience, one that can make their other estate-planning discussions more manageable and productive. Discussing philanthropy and family values opens up a safe haven for examining other matters, especially sensitive topics such as ambivalence regarding wealth, according to Richard Marker, an advisor to families of wealth. Marker believes that by helping families discuss their family legacy and clarify their philanthropic mission and structure, they become more ready and able to address underlying issues of family dynamics and wealth, the very issues that keep some parents from moving forward with their estate planning. “My parents never talked about what they did with their money,” explained Leslie Schultz. She decided early on in her marriage to Howard Schultz that she wanted a different family culture. “I said to Howard, ‘Let’s not have secrets,’” and he agreed. That commitment to openness about money matters eventually led to a series of family meetings which started after all the children had reached their twenties. It continues to this day, one meeting every few years. Leslie makes the point that you try to do the right thing “and hope that it takes.” But you also have to expose children to the value of giving early and often. They actively involved their children in giving from the time they were quite young. When they became young adults, the three children were brought into the decision-making process in their parents’ foundation in a modest way. (They were given discretionary control over 10% of the foundation’s giving.) Now, Jaynie heads the family foundation and her brothers are on the board with her. If the family meetings were sometimes a challenge for the children, they were likewise a challenge for their parents. “It was a bit frightening to share all that financial information with the kids,” admitted Howard. “And later with their children’s spouses,” Leslie added. She described how they were not sure it was a wise idea to have their spouses involved. Regarding their daughter- and sons-in-law, however, “Their trust grew because we were trusting them.” Howard and Leslie’s initial trepidation disappeared. They saw that it worked well to have everyone involved. Now, the Schultz family continues to work, play, discuss Howard and Leslie’s estate, and share in the pleasure of giving away part of that estate to others. It behooves parents to bring their grown children together to discuss the various aspects of their plans. Estate planning guides what is arguably the most important family transition across generations. Dan Rottenberg, author of The Inheritor’s Handbook, estimates that ninety percent of the problems siblings encounter after their parents die could be eliminated if parents would talk openly with their children while they were still living.sup>15 If family discussions take place before parents’ deaths, then children do not have to deal with emotionally charged estate matters precisely when they are most emotionally vulnerable. What needs to be said, and when? How should we talk about our values? How much emphasis should be put on philanthropy? Who should be involved and how? Should we talk about our fears? What is our vision for our family? How do we address the different needs and circumstances of our adult children? There are no simple answers to these questions. Without pat answers, some parents convince themselves that they should postpone or forego estate planning. Other parents try to find experts to give them ready answers. Many parents don’t want to deal with the difficult choices or the complex and sometimes irrational feelings of family members. Their fears, which are quite common, may be legitimate if they lack the communication and interpersonal skills needed to confidently face spouses and children on their own. One of the principal goals of the holistic approach to estate planning is to determine what is truly important to family members as they prepare for this family transition. The object is to help families formulate questions that fit their circumstances and then guide them to find their own answers. No two families’ discussions about their estate and their philanthropic endeavors will look the same. WHAT’S GOING TO HAPPEN AFTER WE’RE GONE? It was standard practice for the Sills family to talk about everything in their family discussions—with the exception of their parents’ money, recalls Art Sills. His family loved discussing and debating all kinds of political, religious, and other emotionally charged issues. But his parent’s money—the one taboo subject—was the topic that begged to be discussed after his mother had a stroke. And if money needed to be discussed, they weren’t going to ignore it or shy away from it. “It wasn’t a conversation I particularly wanted to have, but we did it,” explained Art. His parents had to decide where their money was going. A considerable portion of it was going to the foundation they had established (the Sills Family Foundation, which Art now heads). But how much would go to the foundation and how much would go to the kids and the grandkids? And how would the money, family business, and foundation be managed after their parents died? These were some of the questions that found their way into their family estate meetings. “‘What’s going to happen after we’re gone?’ would have been the title of those meetings,” said Art. His parents convened a meeting with the help of a facilitator and the parents’ estate-planning attorney, who was there to answer any questions the sons had. “My parents’ death—especially my mother’s—was always in the background of the meetings, but it didn’t become the topic of discussion.” His parents wanted Art and his brothers to understand their goals for their foundation. At the same time, they wanted their sons to know that they were not going to tell them how to manage the foundation or make use of its resources. That would be the sons’ decision. As Art reflected on his family’s meeting, he said, “We knew we were sitting in on an unusual conversation.” He explained, “It took us up another rung on the ladder of our family’s ability to talk about issues.” He credits that family meeting with making his two brothers and him more capable of working through challenging interpersonal issues together later in life. It also made conversations among the brothers after his parents died easier than they would have been, had his parents not insisted on having that meeting. The ideal time to begin a dialogue about transferring an estate is when grown children are reasonably established in their lives. Obviously, in some cases family circumstances may not allow parents to wait that long. Various circumstances, such as a parent’s ill health or death, or the need to plan for a handicapped sibling, may force the conversation to occur sooner. Circumstances within a family business may also act as a catalyst for these discussions. Parents may be forced to examine the roles their children might play in the management and ownership of their business. Owners of significant family businesses who have grown children cannot create a realistic estate plan without first figuring out the succession plan for the management of the business. In one such situation, the parents who controlled a large real estate empire brought all five of their adult children together with their spouses for a family retreat with two mediators when the fighting between a brother and two sisters in the business began destroying the fabric of the family. The fighting between the three had gotten so bad that the father threatened to sell the entire business and all of their properties. The highly emotional three-day retreat concluded with an understanding that the three siblings in the business would work with the mediators on a formal partnership charter and the entire family would get together again in three months for a family estate retreat. During the final meeting of the first retreat, when the whole family reconvened in the conference room, the mother announced, “I don’t know how we could have been so dumb not to realize that we needed to talk with everyone about this!” She was right; the family would have been spared a great deal of agony if the entire family had met long before the sibling war had broken out. Family discussions give parents an effective way to address the realities of their final years with the people they love and care about most. They give parents an opportunity to explain their rationale for their intended distribution of assets andpossessions, especially in the case of unequal distributions to children, gifts to others, and philanthropic gifts. They may be the best way to resolve some of the emotional and interpersonal issues that exist in the family. Open discussions establish an expectation that siblings will deal openly and collaboratively with issues that arise after the parents have died. They create and enhance confidence about cross- and intergenerational relationships. They develop and reinforce closeness and bonding among family members. They eliminate or reduce the likelihood of surprises and hidden agendas after the parents die. No surprises means less chance of conflict. Who Initiates Family Estate-Planning Discussions? As previously noted, grown children will often feel the effects of their parents’ estate decisions more than their parents will, so they have an understandable interest in knowing what will happen. While it is always the parents’ right to determine what to do with their assets and whether or not to talk about them, it is reasonable for grown children to request to be informed sooner rather than later, and to have a discussion about the parents’ plans. Parents may be unwilling to consent to their children’s request to have a discussion but the request conveys important information to the parents of which they may otherwise have been oblivious. There should be no fear in asking, but often there is. One dynamic that plays out in many families is children believing their parents don’t want to have such sensitive discussions and parents believing their children don’t want them. Sometimes it is a case of both generations projecting their fear and trepidation onto the other. Another problem is children appearing greedy. Wanting to know what to expect, having a chance to prepare, and getting the opportunity to offer one’s ideas are all healthy, positive reasons for asking parents to discuss their estate plans. It is not helpful to forgo asking to have the discussion for fear of appearing greedy, unless, of course, that is the reason. Estate, legal, and financial advisors can open their clients’ eyes to the broader significance of estate planning. They can help parents realize that an estate plan that reduces taxes to zero but results in family disharmony is not a wise plan. They can educate parents about how the most effective plans take both the individual family members and their relationships into consideration. Who Leads Family Estate-Planning Discussions? Parents who may wish to avoid the entire discussion, or claim they don’t care if their children fight after they are gone, usually react differently when they understand that they can have professional assistance to deal with the issues and feelings that might arise. When parents realize that professionals can create and sustain a safe environment for discussing sensitive subjects, they will often recognize their desire that their children not fight over their inheritance. Family estate discussions need outside, neutral mediators. Mediators allow each family member to be fully engaged in the discussions without any concern about moderating or conducting the meetings. Mediators monitor individuals and their interests and emotional states, intervene when discussions bog down, and keep a record of what transpires. Mediators who are neutral and have no existing relationship with the family members are necessary so that each family member can trust that the professionals guiding the process are not working for any one person, and have everyone’s best interest at heart. Families need mediators who know the issues that need to be discussed and who have led these discussions before, so the family members can make the best use of their time together and not worry that they are missing important issues. Mediation fosters an open, constructive dialogue of difficult subjects, builds a collaborative spirit when people feel at odds with one another, and helps people arrive at mutual understandings and consensual agreements. Conflicts often arise in what seem to be very harmonious families. Family members need to know that the things they say to the family’s mediators can never be divulged, even if a lawsuit were to develop. For a list of organizations providing referrals to licensed mediators, please see Passages, “Managing Conflict and Family Dynamics in Your Family’s Philanthropy,” by Deborah Brody Hamilton. Many people feel compelled to wait until their death to let their children, or others, know about their philanthropic interests and endeavors. Some parents worry that their children will resent their philanthropy and think of it as a zero sum game: the more that goes to others, the less they receive. Certainly, some children may view it that way, but children can surprise parents in this regard. In one such situation, a husband and wife in Arizona with an $8 million estate came to the conclusion that they wanted almost all of their assets to go toward a philanthropic endeavor. Years later, however, they had not taken the first step to make it happen. They were afraid that their three grown children would react negatively to their decision. The couple spoke with John Gromala, a mediator and former estate-planning attorney, who listened to their story and encouraged the couple to tell their children what they were thinking. Careful preparation is critical to the success of family estate discussions. To adequately prepare, mediators need to speak privately and confidentially to all of the family members involved in the process before it begins. Without confidential individual meetings prior to the discussion, the discussion leaders may not know people’s hidden agendas. This limits their ability to steer the discussion properly or to help family members break through impasses that could arise. The key to all preparation is ensuring that the parents are in reasonable agreement about the purpose of the discussions and how they will work together. Some parents spend time with their estate-planning attorney or other advisors beforehand in order to understand the range of options they need to consider. Parents should spend time with the outside mediators beforehand so that the parents fully understand and feel prepared to discuss the range of issues they must address. They must also become comfortable with how the mediators will conduct the meetings and help everyone work through any contentious and emotional topics. The children also need to prepare. A phone call with the mediators can help the children become fully informed about the purpose of the retreat, educate them about the process, and give them an opportunity to voice their apprehensions, concerns, and hopes for the retreat. There are also tools that can help parents and adult children prepare for a retreat. Scott Farnsworth, an estate-planning attorney, has developed what he calls a Personal Legacy Declaration, a collection of questions that helps people become clearer about their life story by jotting down key experiences, enduring values, and themes that have persisted over time.16 Many other similar tools exist. For older parents, estate planning is really a rite of passage—both for themselves, and for their grown children. In traditional estate planning, some of the challenges facing parents and families were ignored. Emphasis was placed on efficiently transferring possessions and financial assets while minimizing taxes. Important as those goals are, they ignore the broader picture. A family with grown children is different from one with young children or teenagers. Estate planning has to change as parents and children grow older. Holistic estate planning addresses the family’s realities by including grown children in the process of planning the transition from one generation to the next. Each person, each set of parents, and each family need to address the questions that are relevant to their particular circumstances. There is no one solution or path that fits all families. Together, family members can come to an understanding of what the family’s legacy will be, what will be maintained, and what will be discarded. It’s not something parents can dictate, and it’s not something many children would care to do without their parents. It’s truly a task for the whole family. Parents of adult children can increase their confidence about how their children will carry on after they depart by bringing all of the adult family members into an open, flexible, collaborative process that explores their wishes, most important values, and the family legacy in the broadest sense of the term. A retreat is essentially a time when people clear a space to focus on something important. It may be a once-in-a-lifetime family event. Many people have noted that the only time their families come together is for weddings and funerals. At these events, family conversations of importance may occur but it’s almost by chance, and often in such situations, someone is not present, sometimes a key player. Family estate-planning retreats give families an opportunity to consciously create those conversations instead of leaving them to chance. These retreats are akin to a family reunion in the way that they are bonding experiences that bring people closer together. They are different, though, in that they don’t involve extended family and are thus much more intimate and focused. Because people are affected by their surroundings, a retreat’s location should be comfortable and provide sufficient privacy for people to talk openly. It should offer enough space for the entire family to be together in the same room and offer space for people to get away and relax when they are not involved in meetings. Ideally, the location gives people a chance to stretch, exercise and be physical because people need activities to counterbalance the sitting and the sometimes intense mental and emotional quality of family meetings. As families anticipate retreats, they sometimes wonder if they’ll have enough to talk about to fill the time. Once retreats begin, they wonder how they’ll ever have time to finish all they want to talk about. People should think in terms of three complete days, which means arriving on day one and then having three solid days to spend together before anyone departs. This block of time allows the natural flow of conversation to develop and themes to emerge. It also gives time for people to mull things over and” sleep on them” if necessary. A retreat is not one long meeting with everyone continually present. Instead, it is a series of meetings that involve various combinations of people. Typically everyone participates in the initial meeting. Then the family mediators usually meet face to face briefly with each person early in the retreat process. Throughout the retreat, various combinations of people will meet with the mediators. Two natural subgroups are the parents and children. Others may include sisters, brothers, in-laws, children working in the family business, and nonworking co-owners in the business. Meetings of sub-groups are not meant to create secrets; rather, they are used to ensure that issues, or things that could become issues, are brought to light and dealt with by all of the appropriate people. In individual and small group meetings, the mediators spend time coaching people on how to say difficult things they need to say in the most effective way possible. Estate planner and mediator briefing: The mediators are briefed by the parents’ planner in person or by phone on the family’s circumstances. Parents and mediators conference: They discuss the goals, approach, and who will participate in the retreat. Individual parent conferences: The mediators and each parent separately explore individual views and goals by phone or in person. They have joint discussions if needed to resolve differences. Participant interviews: The mediators contact each of the adult children and any other participants by phone to ensure that everyone understands the purpose of the retreat and to help them begin to prepare for the meetings. Introductory meeting: The retreat begins with introductions and a quick review of the purposes and process. Individual meetings with each participant: Meetings between the mediators and individual participants help to fully clarify individual’s perspectives and goals. Goal-setting: The family reassembles to discuss their individual goals and establish their common goals for the retreat. Family, group and individual meetings: The family meets as a whole and in small groups to pursue the goals of the meeting. These meetings may be used to allow the parents to share their plans for their assets (possibly with the assistance of their advisors), to explore plans for the parents’ welfare in case of incapacity, to allow feelings and views to be expressed, to clarify the family legacy, etc. Conclusion: Together, all the family members review what has been accomplished, ask questions and confirm decisions as appropriate. Summary document: The mediators prepare and circulate a document summarizing the results of the meetings for comments by all family members. Estate planner, parents and mediator conference: The mediators confer with parents and their advisor, or advisors, to discuss how the summary will be incorporated into the estate plan. James Hughes, personal communication, February 1, 1999. Psychology and Consumer Culture: The Struggle for a Good Life in a Materialistic World, by Tim Kasser and Allen Kanner (editors), American Psychological Association, 2004. The Postponed Generation: Why American Youth Are Growing Up Later, by Susan Littwin, William Morrow & Co., 1986. Navigating the Dark Side of Wealth, by Thayer Cheatham Willis, New Concord Press, 2003. 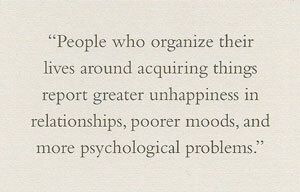 “The secret to happiness,” by David Myers, Yes! Summer, 2004. Douglas Freeman, personal communication, June 20,2004. “Identity and the Life Cycle,” by Erik Erikson, Psychological Issues, 1959. On Death and Dying, by Elisabeth Kübler-Ross, 1969. “Including a Health Professional in Will Drafting Aids Transition,” by Gerald Schneiderman, Trusts & Estates, 1997. Silver Spoon Kids: How successful parents raise responsible children, by Eileen Gallo & Jon Gallo, Contemporary Books, 2002. Wealth in Families, by Charles W Collier, Harvard University, 2001. The Partnership Charter: How to Start Out Right With Your New Business Partnership (Or Fix the One You’re In) by David Gage, Basic Books, 2004. Richard Marker, personal communication, October 5, 2004. John Gromala, personal communication, January 8, 2004. The Inheritor’s Handbook: A Definitive Guide for Beneficiaries by Dan Rottenberg, Simon & Schuster, 1999. Scott Farnsworth, personal communication, June 20, 2004. 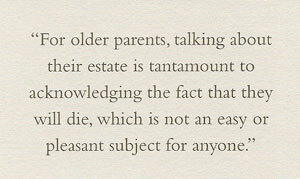 Family Wealth: Keeping it in the Family, by Jay Hughes, 2004. “Holistic Estate Planning And Integrating Mediation in the Planning Process,” by David Gage, John Gromala and Edward Kopf, Real Property, Probate and Trust Journal, 2004. Money Harmony: Resolving Money Conflicts in Your Life and Relationships, by Olivia Mellan, 1994. Preparing Heirs: Five Steps to a Successful Transition of Family Wealth and Values, by Roy Williams, 1992. “Successor Partners: Gifting or Transferring a Business or Real Property to the Next Generation,” by David Gage, John Gromala, and Edward Kopf, ACTEC Journal, 2004. David Gage, Ph.D., is a clinical psychologist, adjunct professor in American University’s Kogod School of Business, and co-founder of BMC Associates, a multidisciplinary firm specializing in conflict prevention and resolution.